← Whoa to the second power! I did some research tonight and looked through the completely unnecessarily large pattern collection for more dress patterns for which I could use double-knit fabric. Love the color blocking opportunity with Vogue 8666. And, while it does not have princess seams per se, I have a sneaking suspicion that there is shaping in those extra bodice seams. Could I be right? Next we have Vogue 8409. I love that bodice. Not sure if I have the body to rock the overall shape, but that bodice is killer! On to Vogue 8529. Possible color blocking opportunity here either with the yoke or the side panels. Not sure if I am enamored with the center front seam on the yoke though. Wondering if I can cut that piece on the fold. Hmmmm…. Then we have Simplicity 2648. Great reviews for this dress, especially from Eugenia. Has different cup sizes. Side panel color blocking oppy? Only drawback is no long sleeves for the dead of winter. The next pattern contender is Simplicity 2337. I really love view A with the vertical gathers on the bodice, the crossover and long sleeves. Bonus: princess seams in front. And the final contender is the Muse knockoff, Butterick 5522. I love those sleeves, but don’t know if I am up to their challenge right now. And I would have to do major futzing to make this look less like the 60’s tent dress it is and into something a little more fitted. I’m not talking sheath dress, but more of a fitted shift dress. So, what do you think? Here’s a poll. Tell me what you think! This entry was posted in Dresses, Sewing. Bookmark the permalink. I voted for 2337 – thanks for pointing out that pattern. I hadn’t seen it yet but I’ll have to pick it up! Also, have you seen Butterick 5523? I’m getting ready to make it in a two-sided knit with the solid color on top and print on the bottom. 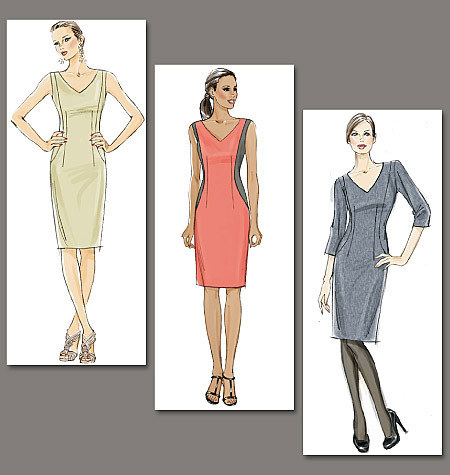 Now that I’m FINALLY FREE from my 3 month coat project, and after making a few skirts, I’m seriously thinking about a “killer” double knit dress too. I like your pattern picks, and I voted for Simplicity 2337. Been loving that pattern since it came out, and I think Vogue has one similar to it. Can’t remember the number, but I think it’s a designer pattern. I want to make a statement dress, but I want it to be simple too – if that makes sense. You’ve got some amazing choices and I really don’t think you could go wrong with any of them. I finally voted for Simplicity 2337 b/c I think the gathered front would be flattering in the torso/midriff section, and you had mentioned that that is an area you feel most self-conscious about. I also think it’s a fab design! Hey, it’s fine to want double knit, but you’ve got to consider the fabric behavior.. Little pleaties on the bodice aren’t going to do well in thick, not very pleatable fabric. Cowl neckline with draping isn’t going to look cool in fabric that doesn’t drape much. The first pattern is kind of a waste too, why have extra darts in a fabric that’d stretch well enough not to require them? I don’t even think you’d get enough drape for the last Butterick’s sleeves. Basically, I think the Simplicity 2648 is the only remotely fabric-appropriate choice. Okay I’m gonna disagree with the fabric comment above. I have some of the same doubleknit that you’re going to work with…having purchased it from the same spot…and I can tell you that the fabric does have a drape, will take a pleat and/or dart nicely without a lot of bulk and will work for all of the dresses you’re considering. Now that said, I don’t have a preference. I think all of them will work out just fine. I am on-board the double-knit fabric train here. I also bought some from Fabric dot com. I only bought 1.5 yards, just in case I didn’t like it. Now I am kicking myself that I did not buy more because I love it and I want some double-knit dresses, too. I voted for that first one – the Vogue pattern. Love it and I can see it on you! Although the pattern Eugenia sew is pretty amazing, too. I think go for a sleeved dress as it will utilise the knit’s stretch well – knit sleeves are so comfy and can be really fitted and sassy. I thought 8409 would be great! It is the same as a burdastyle pattern that I made this year in some stash that I wasn’t that fond of, and I actually wear it heaps and I’m thinking of making it again in a nicer fabric! Like MarieChristine, I would have thought double knit would have been too thick for ruching and a cowl, but maybe the quality in US is different to what we call double knit here! I voted for 2337. That pattern would look great on you! I voted for Simplicity 2468 and I think it would be so easy to draft a longer sleeve that still looks v. chic. The key is to make sure the sleeve doesn’t get too wide, keep it very fitted or stop it after the elbow. I’m completely the wrong person to go to for fashion advice, but here goes anyway: I can see you in V8666, and, later on, it might work well with those great duo-tone sleeves. I think it would be a great style on you, and yes, you’ve probably got just the right fitting options with it, too. Aren’t the pleats on S2337 horizontal? Wouldn’t they look pretty bulky in double knit, especially over the stomach? I think that style works a lot better in a very thin, lycra-blend fabric. I await with great curiousity to see what you choose – I have no experience with double knit at all so this is a great learning opportunity for me too! I vote with the idea of putting those sleeves on a pattern with trimmer lines. Obviously you are very attracted to them – and I don’t blame you. They’re cool! I started a muslin of s2337 for a mother-of-the bride dress (very informal wedding) but put it aside when it became clear there wasn’t enough time to do both the muslin and the dress. My muslin material had no stretch at all and the princess seam was uber difficult to sew, so a double knit might work really well. The directions for the bodice are pretty funky. At least, they didn’t make a lick of sense to me…but that could just be my inexperience. If you choose this pattern, I’ll be following your progress with great interest!